FreshWater Watch is a global programme developed by Earthwatch. Earthwatch is an international environmental organisation which connects people with science and nature. Earthwatch’s mission is to engage people worldwide in scientific field research and education to promote the understanding and action necessary for a sustainable environment. Earthwatch is passionate about objective research and enabling people to experience real science to inspire actions and find solutions to environmental challenges. Participants in Earthwatch’s work are enabled to have hands-on research and learning experiences, so that they can understand and contribute to important issues such as climate change and human/wildlife conflict. Earthwatch has global reach, with more than 40 years’ experience of citizen science, engaging an international community of people from all walks of life - from teachers, students and scientists, to farmers, politicians and CEOs. Impacts and results are enhanced by working in partnership across sectors (business, government, NGOs, education). People have experiences that change their lives - inspiring new ways of thinking, behaving, and decision-making when they return to their communities and work-places. Scientists receive critical funding and support from enthusiastic volunteers to collect data that informs solutions to key environmental issues. Organisations and companies that have a huge influence on our world improve their policies and practices. A new generation of scientists, educators and business leaders gain in-depth understanding of our reliance on the natural world. 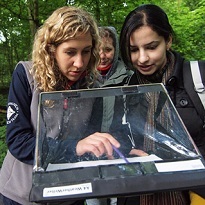 Earthwatch has supported 1,400 field research projects in more than 120 countries. 100,000 people have joined Earthwatch projects, contributing 10,000,000 hours of data collection. 1,600 young scientists have gained early-career experience - inspiring them as the next generation of conservation leaders in the developing world. Around 4,000 students and 5,000 teachers have benefited from Earthwatch fellowships, influencing career choices and providing professional development. Working with more than 20 major international companies, Earthwatch has won an International Green Award for Best Employee Engagement and been rated by the Financial Times as one of the Top 10 Global Environmental NGOs for Corporate Sector Partnerships. See Earthwatch.org for more information.